Review: Do you love horses and want to know what is happening to them? Would you like to try and help them? 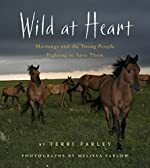 Then Wild at Heart by Terri Farley is the book for you! Wild at Heart includes many different facts and stories about the things that are hurting horses. Find out why people do these things, how they do them and real life occurrences that the author, Terri Farley, actually saw! In Wild at Heart you can read about how people help these horses to save them. Will the horses be saved? Wild at Heart is a book primarily for an audience ages 12 years old through adult. Wild at Heart has more difficult vocabulary and beautiful photographs that were taken by Melissa Farlow. In Wild at Heart, there are extra parts such as ÒEyewitnessÓ sections which tell about sightings the authors saw and stories about young people who help horses. You can tell that Terri Farley and Melissa Farlow have a passion for horses. I enjoyed reading Wild at Heart and I think you will too.